PUNTA GORDA, Fla. -- The Charlotte County Sheriff’s Office said they are searching a second location in relation to the Christine Flahive case . 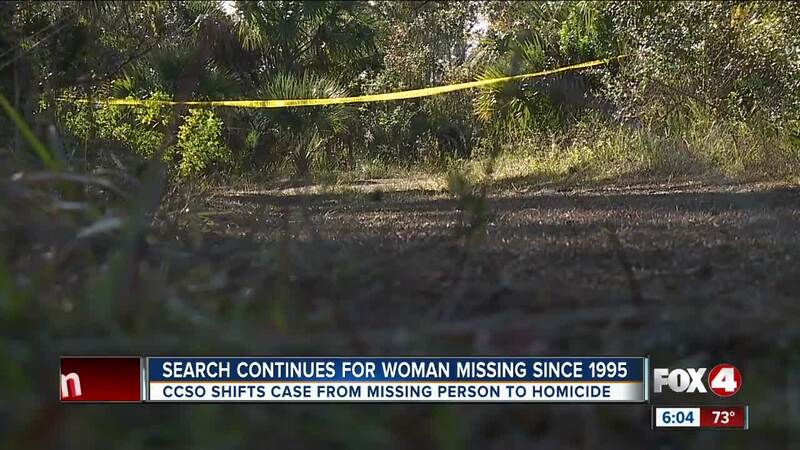 The 42-year-old mother went missing on January 4, 1995 in Punta Gorda. Last Friday, cold case investigators searched a wooded area behind Charlotte Behavioral Health Complex on Educational Avenue. The sheriff's office said they received new witness testimony that Flahive was at a residence in the area at around the time she went missing. Detectives said she was heading to a downtown bar in Punta Gorda but never returned home. On Monday, investigators searched another wooded area about 4 miles way. It's located at Fairway Drive and Indian Creek Lane, across the street from East Elementary School. The sheriff’s office said they sent out a search team to the location on Monday and will send another team out again Tuesday.